Control a robot shark and destroy enemies! In the action game Robot Shark, you can control a robotic shark and explore an entire city! But that’s not all… if need be, you can even transform into a humanoid robot. As you move through different parts of the city, you’ll soon run into evil enemy robots. Use all your attacks to defeat them, while defending your robot at the same time. But no matter if it’s in shark or humanoid form, controlling your robot is super intuitive. 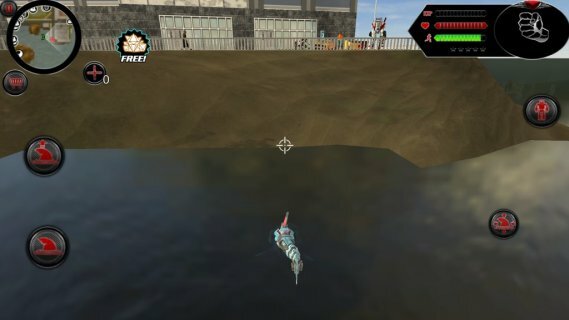 Just tap on the action buttons to transform or attack, and tap on the d-pad to move your robot or the arrows to move the shark’s fin and swim through the water. Help a robotic shark destroy all its enemies in the action-packed game Robot Shark. Explore every inch of the city, use all your attacks, and destroy any car or building you in your way!